Tavora Reserve, near Palmerston, was the Yellow-eyed Penguin Trust’s second reserve, purchased in 1993. It includes a prominent headland called Bobby’s Head. 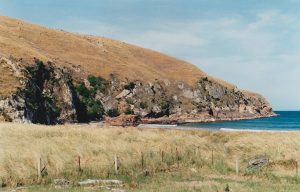 Tavora (named after the ancient Maori name for the yellow-eyed penguin) had the dubious distinction of being one of the most modified hoiho habitats on the Otago coast. Intensive farming practices over the decades had destroyed most of the natural vegetation. Since its inception, the Trust has put a great deal of effort into improving and enhancing the breeding habitat for hoiho. Some of the early plantings at the south beach in 1994-96 were carried out by staff from Mainland Cheese, the Trust’s original and founding sponsor. To this day they are known as the Mainland plantings. The estimated minimum total of hoiho nests varies between 1 – 3 after a severe predation episode and a landslide in the late 1990s that killed several hoiho. Since 2001 there has also been emphasis on restoring the beach and dune system to its natural state. Essential to this process is the replacement of introduced marram grass with the native golden sedge/pikao Ficinia spiralis. Other dune species, including shore spurge Euphorbia glauca, sand tussock Austrofestuca littoralis and sand coprosma Coprosma acerosa, have also been planted. Dune plantings and riparian plantings alongside the Tavora Creek are continuing. The earliest plantings are now up to 3m tall and beginning to form a closed canopy along the access track beside the creek. 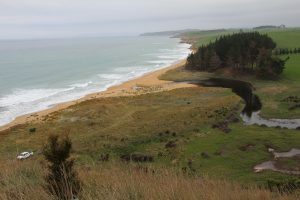 The native dune plantings on the beach now form a golden ribbon, backed by riparian plantings and the beginnings of a totara dune forest. 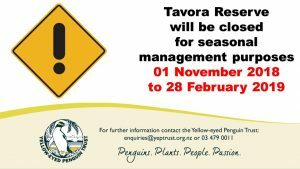 This reserve will be CLOSED to the public from 01 November 2018 – 28 February 2019 for seasonal management purposes. Last summer, beach observations were undertaken and as many as ten hoiho were seen on the South Beach. This shows there is a real possibility that breeding numbers would increase if the right management regimes were implemented. The Trust believes that disturbance by visitors to their breeding area is detrimental to the prospecting birds (for suitable breeding sites) and subsequent nesting success. Therefore the Trust will close the reserve during the crucial period of November – February, ultimately giving hoiho the least disturbance for breeding.